Published: May 28, 2014 at 03:59 p.m. Updated: May 29, 2014 at 07:01 p.m.
Malcolm Glazer, who purchased the Tampa Bay Buccaneers in 1995 and hoisted the team's first Super Bowl trophy eight years later, died Wednesday morning at the age of 85. 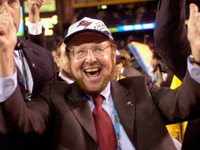 Glazer served as a guiding force in the Buccaneers' rise as a respected NFL power following decades of team struggles. In Glazer's time as owner, the team earned seven playoff berths, five playoff wins and the team's lone Super Bowl title in the 2002 season. "He was a genuine, hard-working, one-of-a-kind man," Jon Gruden -- who coached that championship team -- told the Tampa Bay Times. "He was a friend, a trailblazer and I'll miss him." Glazer was also a major player on a league level. He served on the NFL's Finance Committee and played a key role in Tampa hosting the Super Bowl in 2001 and 2009. The Bucs' official website wrote that Linda Glazer, along with their five sons and daughter, will continue to own and operate the team. NFL Media's Warren Sapp, who starred for the Bucs from 1995 to 2003 on his way to the Hall of Fame, weighed in on the influential owner's death. "As the first pick of the Glazer family, I'm proud to be that pick and I'm very saddened at the hearing of his passing -- a true giant as a NFL owner and I was proud to call him my owner and boss plus a friend!" Sapp said. "I love the family." In 2005, Glazer purchased the Manchester United soccer team. The team won five Premier League titles (2007, 2008, 2009, 2011 and 2013), as well as the 2008 UEFA Champions League. A resident of Palm Beach, Florida, Glazer leaves behind his wife, Linda, six children and 14 grandchildren.